Please call owner Brian at 920-737-8866 or e-mail brian.engum@naturesway.com . This 2008 Cruisers Yachts 330 Express, now sold as the 350 Express is in great condition. This boat powered by 8.1 Volvo's is a 50MPH boat with a cruising speed in the mid 30’s. 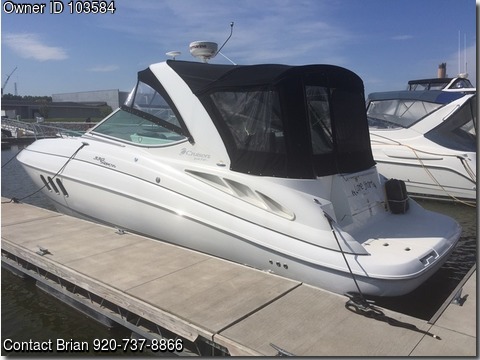 Cruisers is known for their great layouts with lots of room both on top as well as below, with using the full width of the boat by having the walk through windshield. Throughout the boat you will find an abundant amount of storage, including storage for canvas under the drivers seat. The hull of the Cruisers is a very easy boat to drive with a great cruising speed and can stay on plane at low speeds. The canvas includes screens within all of the sections of the camper top, including screen door leading down to the Galley/Salon. The boat is equipped with Kohler Generator, GPS, Radar, VHF, Bow Thruster, Cockpit refrigerator, sun lounge on bow. The boat is regularly maintained and stored in heated storage. We Love the boat, but looking to move up. Fuel Tanks: 232 gal, Fresh Water: 40 gal, Holding tank: 30 gal, Number of cabins: 2, Number of heads: 1. Twin Volvo 8.1Gi engines, 375HP each, Volvo Out drives Hours: 395. Depthsounder, Plotter, GPS, VHF, Updated Clarion Head Unit, Raymarine GPS, Automatic Fire Extinguisher, Hydraulic Trim Tabs, Microwave with Coffee Maker, Electric Head, Electric Two Burner Stove, Kohler Generator, Bow Thruster, Air Conditioning, Heating, Cockpit Refrigerator and freezer, Galley Refrigerator and freezer, Cockpit Wet Bar, Cockpit Shower, Radar Arch, Full Camper Top with Screen Side Curtains.